My mission is simple: Teach every living thing how to keep their kitchen knives sharp. Sharp is fast. Sharp is fun. Sharp is the key to kitchen happiness. Find a professional knife sharpener, view a video on how to hone, or read a highly opinionated blog post on the latest kitchen gadget—it’s all here! Don't miss my How-to-Hone videos! 2) Never use your knives to hack at turkey joints or saw through frozen cookie dough (or anything else frozen for that matter). They’re not chisels or cleavers, but highly-tuned instruments. 3) Never soak them in the sink—or leave them in a puddle of tomato puree. They may be stainless steel, but their super-fine edges are suckers for corrosion. 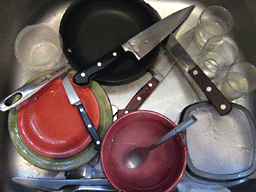 5) Ban them from the dishwasher—no matter what the manufacturer’s warranty says. 6) Never store them in a drawer so they can bang around with the riffraff. Always use a knife block or edge protectors. 8) Sharpen them, or get them sharpened, once a year. Maybe sooner if you’re a heavy-duty user. 9) Never ever sharpen them with the can-opener sharpener like your Mom might of had. Either take them to a qualified pro or learn how to use a quality sharpening system. 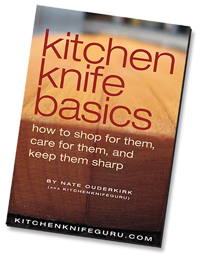 Kitchen Knife Basics has gotten five-star reviews on Amazon!